You have to laugh at yourself. You'd cry your eyes out if you didn't. 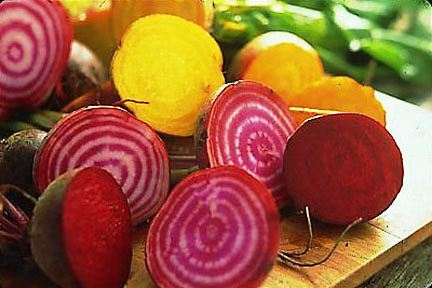 It's spring, which means beets. For those of you with beet issues, just leave the post now, because I love them in a very prejudiced way and I don't have time for non-believers. DeCicco's always has beautiful produce and on my last trip they had gorgeous, fat, golden beets, which are my very favorite of all beets. I'd had my eye on this golden beet and green bean salad I pinned from Martha Stewart. I remembered to grab crumbled goat cheese and I swear, I swear I bought two bags of French green beans—one for Easter, and one for the salad. I must have made both bags on Easter because after I'd roasted the beets and had the water boiling to blanch the beans, I went to the fridge and...no beans. What? Of course there are beans, I bought two bags because I knew I was making this salad! No! No this is not happening! You know that thing where you search the fridge thoroughly for something you know is there. But it's not. But you keep going back to the fridge and searching again? In weird places like the butter drawer? So anyway, once I was convinced that there were no beans to be had, I kicked myself around the kitchen a couple times but then the show had to go on. I regrouped by roasting some asparagus and it worked out fine, it was delicious. Just imagine it's very fat green beans, OK? One other thing: I usually roast beets wrapped in foil, but pressed for time, I cut them into 1" dice and roasted them direct on the baking sheet at 425. This is fine, but in small dice at high temp they will caramelize very quickly, and once you smell burning sugar, it's just a wee bit too late. Jeeps and I ate the really scorched ones and left the pretties for the photo shoot. It's all good really. Preheat oven to 425. Peel and trim beets and cut into 1" dice. Toss with olive oil, salt and pepper, spread on baking sheet, and roast for 10 minutes. Shake the sheet to redistribute and roast another 10 minutes. Watch carefully to avoid burning. (Alternatively you can wrap the beets in foil and roast for about an hour). Transfer beets to a large bowl. Cook haricots verts in boiling salted water until bright green and crisp tender, about 2 minutes. Transfer to ice-water bath, and drain. Add to beets. Mix vinegar, shallot, and mustard in a small bowl. Add oil in a slow, steady stream, whisking until emulsified. Toss with vegetables, and season with salt and pepper. Stir in torn basil and goat cheese. Garnish with basil leaves. I added some pine nuts as well. It's a salad, there are no rules.